I recently attended the amazing Essence Cosmetics event in Manchester, you can read my post on the launch and more information about Essence cosmetics, here. I received so many products, so I am going to split the products up into categories such as lips, eyes, face, nails etc. This post is all about the lip products I received (not including a few products I put into giveaway packs). Essence XXL Shine Lip glosses: I managed to pick up the shades 'pretty in hibiscus' which is the first product on the left and the shade 'velvet rose'. I also have the shade 'just gorgeous' from the same line but I forgot to photograph it - too much makeup! The 'pretty in hibiscus' shade is so glossy and shiny, it doesn't have much colour but it is nice. The 'velvet rose' shade is a matte and I was excited to try it out but it is so patchy and horrible on my lips! The shade I forgot to photograph 'just gorgeous' is my favourite it is a nice bright medium pink. Overall, they are nice but the matte one 'velvet rose' is awful in my opinion, it is one of the very very few products that I am not too happy with. Essence Glow Tinted Lip Balm: I only picked up one of these in the shade 'light up' which is a bright, almost fuchsia pink, it has so much colour which is unusual for a tinted lip balm. It feels very smooth and moisturising on the lips but it can be a bit too creamy and a little bit patchy. Essence Long-lasting Lipsticks: I had my eye on these before the event so I knew I wanted to get them. I picked the shades 'barely there' and 'blush my lips' both of which have a cute E logo on them. The lipsticks apply so smoothly and evenly, they are very pigmented and not too creamy. I adore the shade 'barely there' I have been using it almost everyday since I received it. I haven't tested the longevity yet but I think they will last for a while. Essence Lipstick: This one is not part of the long-lasting range, I have the shade 'all about cupcake' which is such a cute name and the shade is equally as cute. It is a natural medium baby pink which really isn't a shade I usually go for but it looks so pretty on the lips. It is fairly sheer, slightly glossy, moisturising and smooth. A fantastic everyday lipstick. There are all of the Essence lip products I picked/received from the event, I am very happy with the majority of products. My favourite product from this category has to be the long-lasting lipstick in 'barely there'. I have left a few lip products aside for my current giveaway and a giveaway in the future. Click here to go to my current international Essence giveaway, it ends soon! Have you tried any Essence lip products? If so, which one is your favourite? I always try to use long lasting lipsticks! 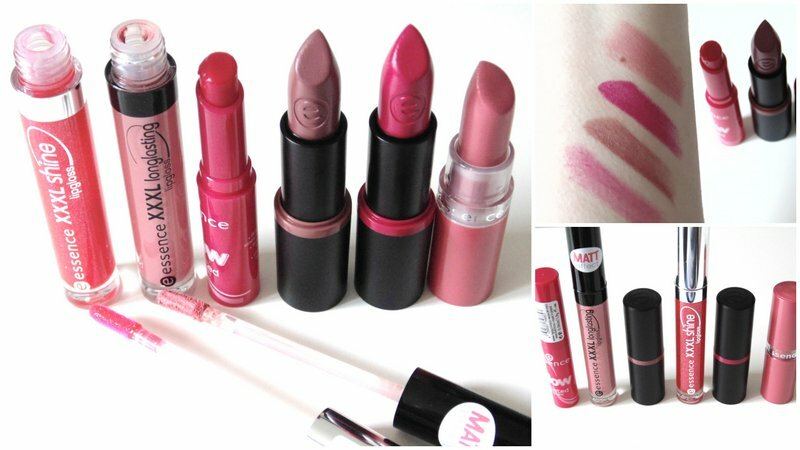 I love their long lasting lipsticks, but my favourite Essence lip products hands down are their matt lip creams (old version). Unfortunately, as far as I've heard the new version of these are not the best.